When I jet set somewhere, I always walk and walk and walk around whatever destination I am in so I can really explore. Of course, that gives me tired and sore feet, and so I am always on a mission to find comfy shoes that are also stylish. Well my female jet setters, I think I found something that is awesome and that you are going to love too...Fit in Clouds! 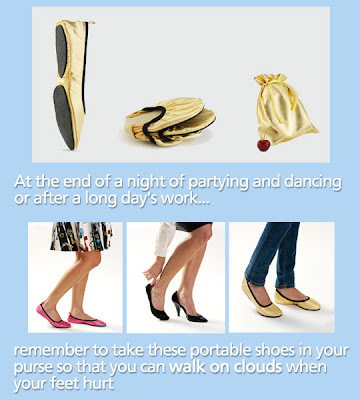 The "Clouds" are the portable ballet flats that fold and fit in a pouch slightly bigger than the size of an i-phone. You can carry this around with you in your purse, and when your feet get tired, just slip on your "clouds." They have thick rubber soles, so while they look like they are indoor slippers, they can be worn while walking around on the street. They come in all different colors, the sizes come in Small (5-6), Medium (6.5-7), Large (7.5-8.5) and X-Large (9 & up), and they range in price from $18.95-$24.95...so they are totally affordable! The ones I want are these Ocean Blue ones...love the color and the bling! If you do decide to order a pair, make sure to let them know that you heard about them through Jet Set Smart! Happy Comfy Jet Setting in Fashion!